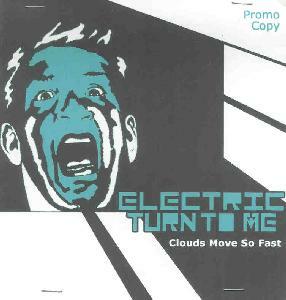 Electric Turn To Me - "Clouds Move So Fast"
A 17-minute EP from this fledgling New York band who's already gotten some favorable press in their hometown. Clouds Move So Fast showcases the group's glam/punk roots (Siouxsie and the Banshees, in particular, but The Teardrop Explodes and Echo and the Bunnymen also come to mind). Early Doors (minus Jim Morrison's acid-trashed presence) is another key reference point. Most of the songs feature driving guitars, quirky vocals (Siouxsie crossbred with Kate Bush on Demerol), and very straight-ahead tight arrangements. "Pick up the Trail" and "Wrestle with Me Angel" are the stand out tracks, but each of the other five songs creates its own unique space between your ears. Teutonic chanteuse Silke adds a distinctive angst-driven "gothiness" to most of the songs but the group definitely plays as a group, no one member either stepping into the foreground or receding into the shadows. And this is their real strength, as it lends an authenticity to ETTM's music often lacking in others of the same pedigree.